This is the fourth post in our series, Musical Professions, in which we will be taking a closer look at the myriad of careers available to those with a background in, and a passion for music! Events: Events are one of the best places to get yourself out there as a performer. Common events at which musical performances are likely are weddings, funerals, fundraisers, galas, etc… These are often excellent venues at which to start performing because the musical performances are usually shorter sets, and the requirements specific to the occasion, such as a string quartet performing while the bride walks down the aisle at a wedding. Musicals/Operas/Orchestra: These musical events are very large in scope and require intense preparations to audition for a role. Once a performer has secured a role, there is even more work to be done! Rehearsals, costuming, lights, sets, staging, all need to be considered for a performance on this scale. Performing for a larger musical work like this is a big commitment of time, and energy, but can be very rewarding, as it gives the performer the opportunity to perform the same music for a different audience each time, and experiment with how the changing audience impacts the energy of their performance! Recital: A recital is an excellent way to perform music, with an attentive audience, and a relatively quiet performance space. Recitals require advanced preparation of repertoire, and usually last around one hour, though they can be longer. Generally, recitals are about music above all else, and can often feel more intimate than other kinds of performances. Busking: This relatively spontaneous type of performance is another great way to introduce oneself to performance. A busking license is required in most municipalities, but once acquired, the performer is generally at liberty to decide when and where and how they want to perform! 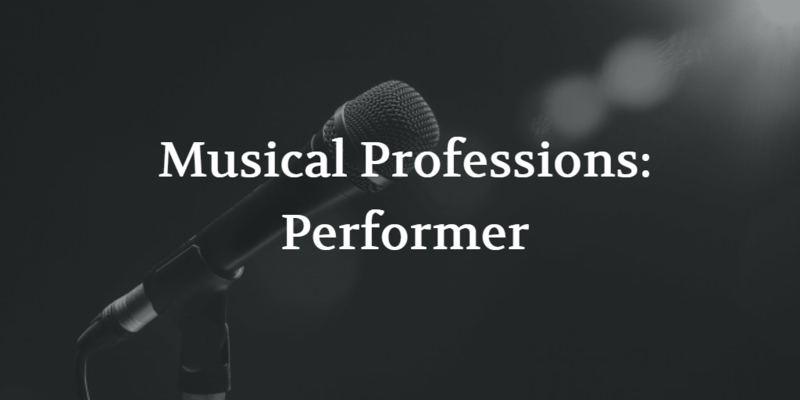 The opportunities are endless for a self-motivated, versatile, and gregarious performer! What other types of opportunities are there for performers? Tell us in the comments below!